Transformational Speaker. Master Teacher. Business Mentor. Best-Selling Author. Awarded an Honorary Doctorate Degree from Indiana Tech University in 2014 for her more than 20 years of service as an entrepreneur, K-12 educator, author, business mentor, and leadership coach, Terré stands proudly with others who've received this lifetime honor. The early years of her life would never lead one to imagine that one day she'd be called "Doctor", be a graduate of Northwestern University, live, work, and travel abroad, speak on stages in front thousands, or inspire women, business leaders, and corporate teams to improve their mindsets, overcome self-imposed limitations, and achieve unfathomable success, but she has done all of these things and so much more. Her life is a mosaic of grit, courage, and pure determination. Her story is as unique as her DNA, born the oldest child of teen parents, who both battled drug addiction, the early years of her life were turbulent. A byproduct of welfare, public school education, and the projects, she was a child riddled with low self-confidence, doubt, and fear of being "found out". When she shares her story of overcoming a challenged childhood, divorce, bankruptcy, and a major illness that nearly claimed her life in 2017, her audiences are drawn to her story and inspired by her resilience. Her successes in life and her story are not parallel. They are as opposite as two left shoes and with her story, she inspires change in sales teams, corporate leaders, and educators. Terré believes that it isn't our fault what happens to us in life, but it is our responsibility to change the narrative. Today, she speaks and inspires audiences on stages as a problem solver for corporations and educational institutions, helping solve the problem of instilling confidence into leaders who feel like imposters, empowering C-Suite women to lead more boldly, inspiring educators to fervently teach students who sometimes seem unteachable and giving women tools to go from employee to entrepreneur. DramaSmarts: At the age of 30 she founded her first company, DramaSmarts, while living in Chicago, IL. Over the course of more than 8 years, she touched the lives of tens of thousands of students throughout Chicago and Cleveland, Ohio during the after school hours. It was there that she honed her business acumen, taught herself branding, marketing, team building and management, in addiiton to HR and this eventually lead to the work she would come to do as a business consultant for other entrepreneurs. EnvisionU: Today she is the CEO of EnvisionU, where she mentors, coaches, and provides educational books, digital products, courses, and other resources for entrepreneurs. 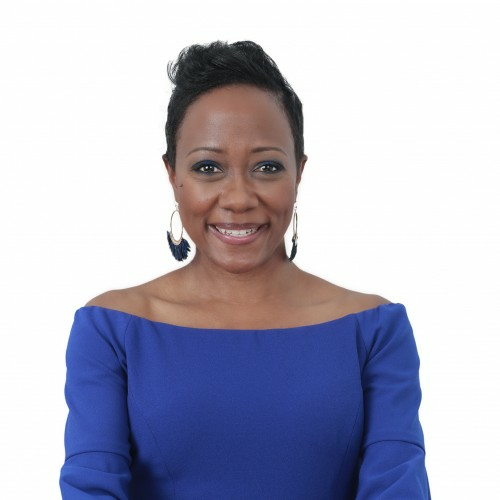 She has been featured in news articles, magazines, and on television for her work as a Master Business Strategist and a mentor to women entrepreneurs. 1. Terré is Transparent – She has an authenticity on stage that stirs people's emotions, reaches them at their core and makes her relatable across gender, ethnicity, and socio-economic status. 2.Customizable Speeches - Terré speeches are tailored to your audience to help them overcome adversity and develop an unstoppable mindset. 3. Tools and Takeaways - Your audience will be empowered and inspired with the tools they need to create immediate and long lasting change. 4. Unique & Universal – There's nothing like a story that reminds us of the resilience of the human spirit. Terré's story is unique, yet universal in many ways. She ignites change in audiences and inspires them to reach new heights, challenge their greatest fears, and face life resiliently. 5. It's All About You – Terré is a powerful transformational speaker who uses her personal story to convey her message to your audience, but she understands innately that her message is about you and your client and that her job is to assure that she delivers a keynote that resonates, translates, and garners the results you desire. Let it be known, Terré is a master teacher, storyteller, and enthusiastic business woman who makes it her job to deliver results for her audiences, so that each person walks away with the tools they need to create change, lead more confidently, and overcome any obstacle that stands before them. Audiences are moved by Terré's transparency, charisma, and confidence on stage. Book Terré today. Find out more about Terré (Taray) Holmes at http://www.terreholmes.com.